Please Note: Single cartridges for collectors available, please see below in related items. History of the 45 Winchester Magnum Cartridge:The .45 Winchester Magnum, a.k.a. .45 Win Mag. as introduced in 1978, and chambered in the Wildey "gas-operated" pistol and later in the T/C Thompson/Center Contender pistol. 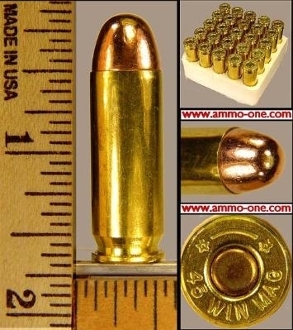 The 45 Win Mag is similar to the 45ACP but about 1/3" longer. It is a great hunting cartridge for a large semi-auto pistol like the Wildey, Desert Eagle, and LAR Grizzley.